Did your parents send you to Earth from the plant Krypton, just so you could protect your baby cousin? Yeah, us neither, but that hasn't stopped us from wondering what it would be like to be Kara Danvers, AKA Supergirl, AKA the coolest Kryptonian to ever travel to Earth. She gets to fly through air like a bird, she gets to use her super strength to smack down all the bad guys and she gets to wear a really neat superhero outfit. We've spent a good deal of time researching ways to get super powers, but as of yet, it seems that we're all just stuck being normal people. We did stumble across her some stellar versions of Supergirl's costume though. So, we thought the least that we could do was share those with you. Even if they don't make you stronger than a locomotive, they will make you feel like a true superhero! 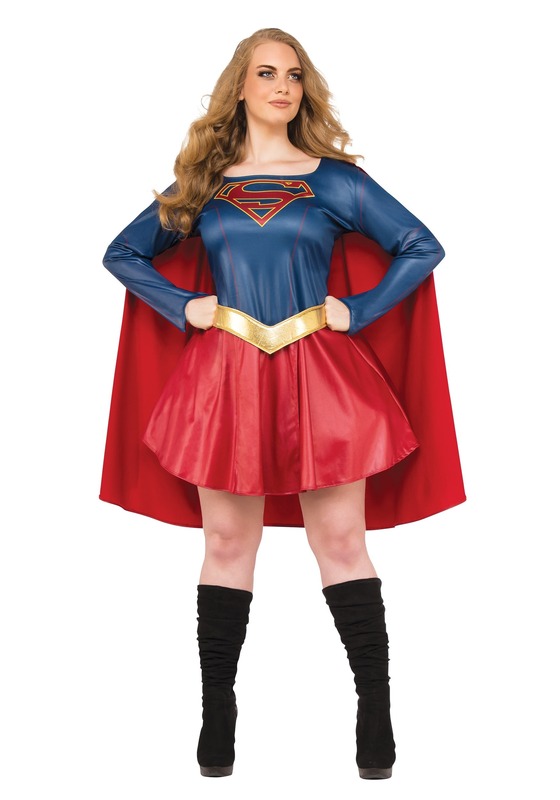 Based on the hit TV series, this plus size Supergirl costume has a shiny blue top with the “S” shield on the front. The skirt is a bright red color and the included foam belt is a bright gold color. The final piece to this outfit is the red cape, which no hero should leave home without! Finally, you get that hero style that you've always wanted. We'll keep working on the whole super powers thing. If we make any breakthroughs, we'll let you know.